We are only at the beginning of an era of design changes that will make the tech products we have in our homes and offices look and feel vastly different. My first portable PC (you’d never call it a laptop), was made by Panasonic. It cost something like $7K in today’s dollars (allowing for inflation), weighed 35 pounds and included a thermal printer. I also work from home so unlike my office-oriented peers, part of what I think about when I equip or update my home office is the printer — even though it’s no longer integrated with my laptop (thankfully). As the PC market has improved, HP and most of its peers have shifted back to design as a differentiator. The result has been two very interesting new products: the Spectre Folio, a leather-clad 2-in-1 that pulls from the past to create a more ergonomic natural product; and the Tango printer, which is designed to hide in the home or home office until needed. But I think we are only at the beginning of an era of design changes that will make the tech products we have in our offices — whether they’re in our homes or not — look and feel vastly different. Apple really stopped leading in design about the time that Steve Jobs stepped away as CEO, but it took a while for the market to realize that the critical role of technology design in the segment had been underserved. Amazon did step in aggressively with digital assistants and, interestingly, Apple appeared to follow. Which is pretty amazing, given that no one really thought of Amazon as a hardware vendor, let alone one that could out-execute/out-design Apple. HP has clearly understood the opportunity this gap presents in the PC and printer space with the Folio PC and Tango printer. Bound in leather, the Folio is a 2-in-1 that looks like something designed for the worker of the 1950s, but with the technology of today. The leather gives it an elegance when holding it like an old-fashioned portfolio, likely the peak of ergonomic design for those likely to write standing up (you don’t always need to reinvent the wheel). Knowing that most 2-in-1 customers don’t use them in tablet mode, designing a form factor that updates a successful hand-held design from the past might get those users to embrace tablet mode. Let’s face it, the portfolio form factor effectively helped people use that product as intended. The Tango printer addresses the well-understood problem that most printers look lousy in the home. Like most office products, they just don’t seem to work in an environment where materials, colors and design preferences are dramatically different from the generic colors and shapes in most office settings. In the home, people tend toward more natural materials, organic lines, and, because we have to live with them, pleasing artistic designs. And form often trumps function (think of the lights in your home). That’s Tango. 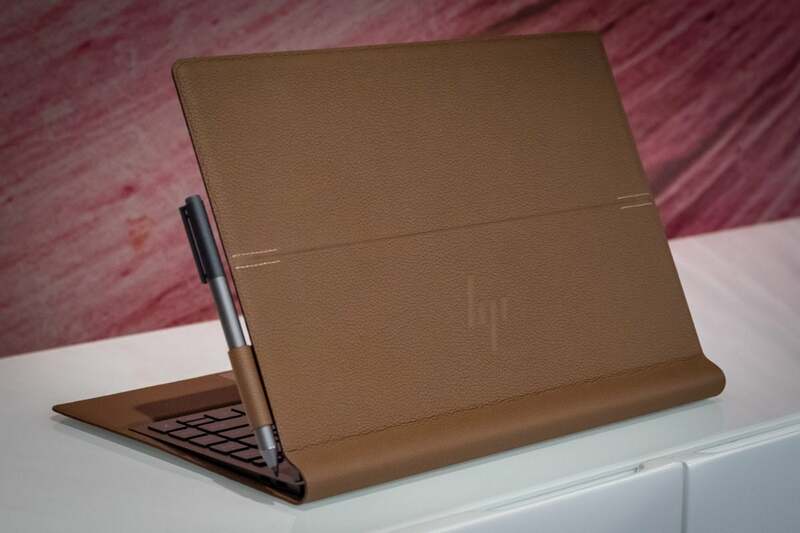 It has no display (it uses your smartphone for control and management), it’s wrapped by material that looks like it belongs in a home, it has organic lines and, according to HP, it’s selling extremely well. This is only the tip of the iceberg. With Apple out of the way and a vast advancement in tools, information and capability, creative professionals will be designing some amazing things for us and for themselves. 3D printing will drive designs that better lend themselves to the use of 3D printers and far higher levels of customization at the point of purchase than every thought possible. The advancement of wrap technology (which has evolved to better emulate natural materials like wood and metal over the years) will enhance that as well. Printing capability — which already allows for labels and finishes that are both unique to each buyer and can be delivered at scale — will allow us to help create products that are unique to us. Initially this may simply be ever more creative ways to add names or unique graphics to an offering. But eventually, this could drift to custom colors, finishes and tighter ties to sports teams or brands the buyer wants to associate with (corporate, movie character, star or product). Finally, we’re entering a wave where products are more focused on how we use them and on where they will reside as opposed to in the more typical vacuum. This means more focus on ergonomics, granular personalization and, eventually, the ability to chose not only your own design but your own designer. We’re at the forefront of a major change in terms of the level of individual customization we’ll have access to. Most consumers aren’t ready for this and will feel far more comfortable with following the herd. But there are a lot of natural rebels and the market is changing in a way that will drive a level of individuality that just hasn’t been possible (outside of the rich and famous). By 2030, the homes and offices we live and in, and want to live and work in, will look very different — not only from the way they are today, but from each other.